Take your smartphone and tablet photographyto the next level with this professional universal 3-in-1 HD lens kit. 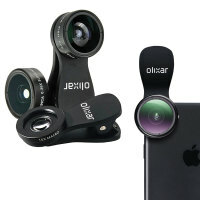 Combining 180 degree fisheye, super wide-angle and 15x macro lenses in one easy quick-connect product with 2 universal clips by Olixar. This is exactly what i was looking for and was delivered promptly, thanks very much. The wife is extremely pleased with the item. The Olixar Premium HD Camera Lens Kit is a unique clip-on lens solution, which allows you to instantly transform your smartphone or tablet camera to take one of three different types of photo using the included lenses. 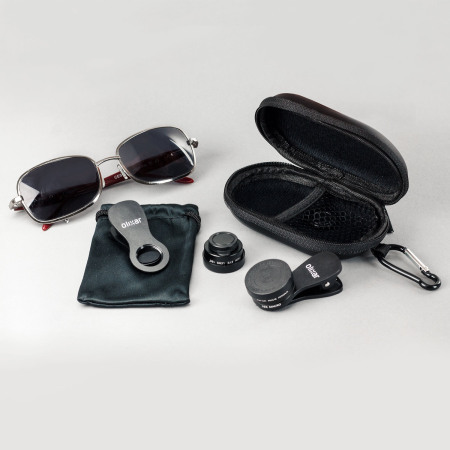 This kit features premium quality HD lenses made from high quality glass for superb clarity, with robust and precision made metal casings. With these tools at your disposal the only limit to your photography is your imagination. Have fun and experiment and you'll find amazing results and artistic freedom are only seconds away. Please note: For those phones that feature dual camera lenses. You can only cover one at a time so ensure you use your primary camera for the selected mode. Any modes that require two lenses are not compatible. 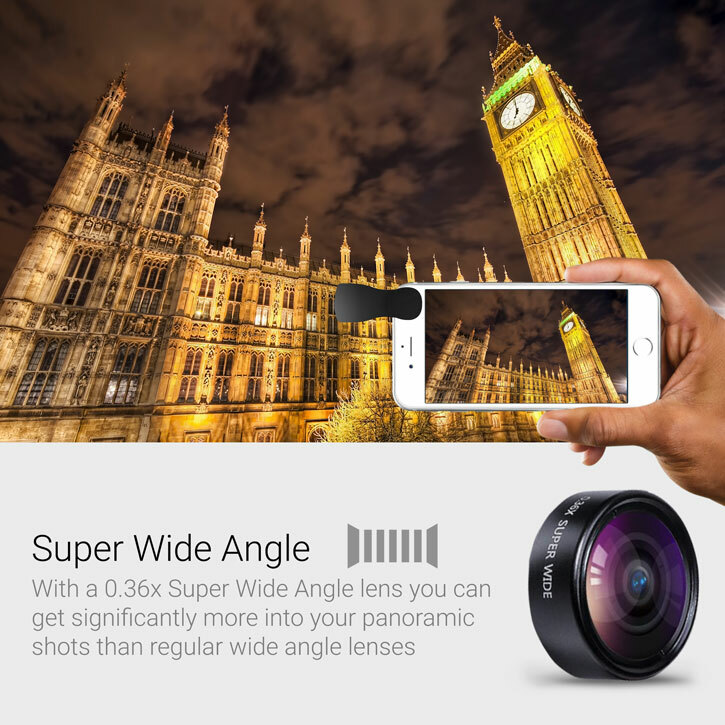 0.36x Super Wide Angle Lens - Perfect for capturing more of the world around you, allowing you to take photos of landscapes and group photos far easier than ever. This lens features 0.36x zoom angle for capturing far more in shot than other lens kits of this type. What this means is you can get closer to your subject for greater detail, without compromising on the amount of content in the shot. No more having to stand a mile away to get the Houses of Parliament, Grand Canyon or Sydney Opera House in their entirety. Wedding parties, large extended families or sweeping vistas are all back on the menu, and in the kind of sharp detail your awesome smartphone or tablet camera deserves. 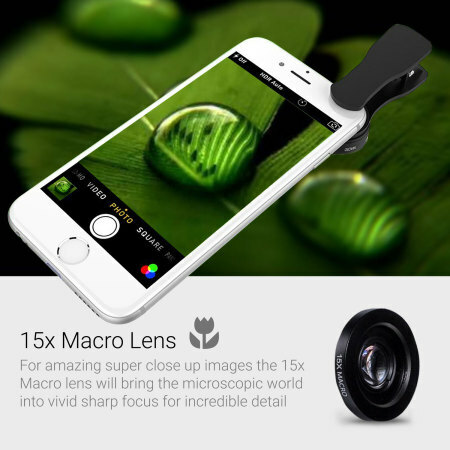 15x Macro Lens - The 15x Macro lens allows you to achieve shots that are extremely close to an object, great for taking shots of small items to view every last detail up close. With a 15x zoom lens on offer you can capture the microscopic world in detail you only dreamed about before. Just unscrew the Super Wide Angle Lens from the Macro and use it on its own for super close up detail shots. 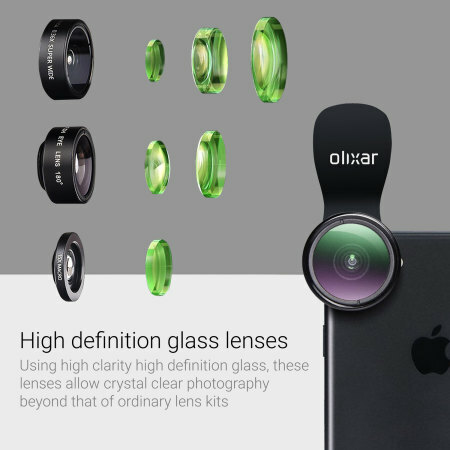 This is a far better quality and clarity than usually on offer with smartphone lenses and you're sure to find the results incredible. Make sure you get the lens close to the subject matter, no more than a centimetre or two. The results will be spectacular and impossible to get without using a lens of this nature otherwise. 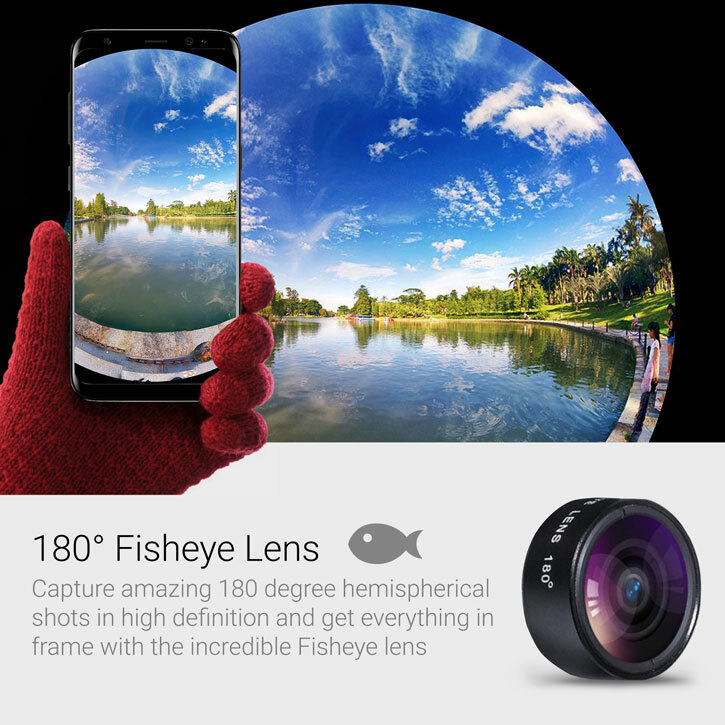 180 Degree Fisheye Lens - With rounded edges instead of square ones, the Fisheye is an ultra wide angle lens. Where it differs from the wide angle lens is that it curves on 2 axis, to get a very dramatic view of everything within 180 degrees in every direction - in other words everything in a complete hemispherical arc in whichever direction your facing your camera. This is very much how a fish views the world, hence the name. What this means for you and your photography is very dramatic and exciting shots that are ideal for scenic views, sporting activities and much more besides. Have fun and see what you can come up with. Get creative. 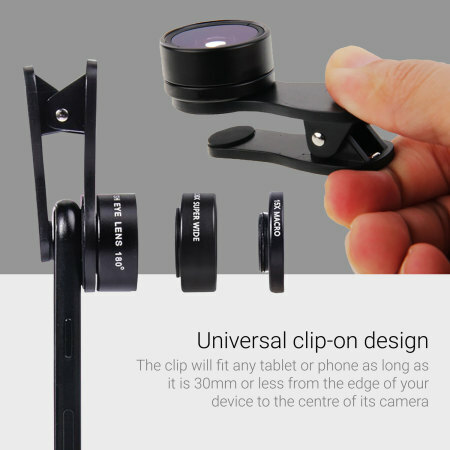 With the included universal spring-loaded clips (you get 2 in the kit), you can attach the camera lens of your choice to either your smartphone or tablet for stunning photography simply not possible with the device's built-in hardware. All you need to do is make sure there is 30mm between the centre of your camera lens and the outer edge of your device. Mounting is easy. Just pinch the clip until the grips open and fit to your device. You can choose front or rear facing cameras and there's a padded buffer to make sure your device suffers no damage from the clip. The Premium 3-in-1 Universal Clip HD Camera Lens is unique in that it does not require a special case or adapter. Simply use the spring-loaded clip to attach over the existing camera on your smartphone or tablet for immediate results. 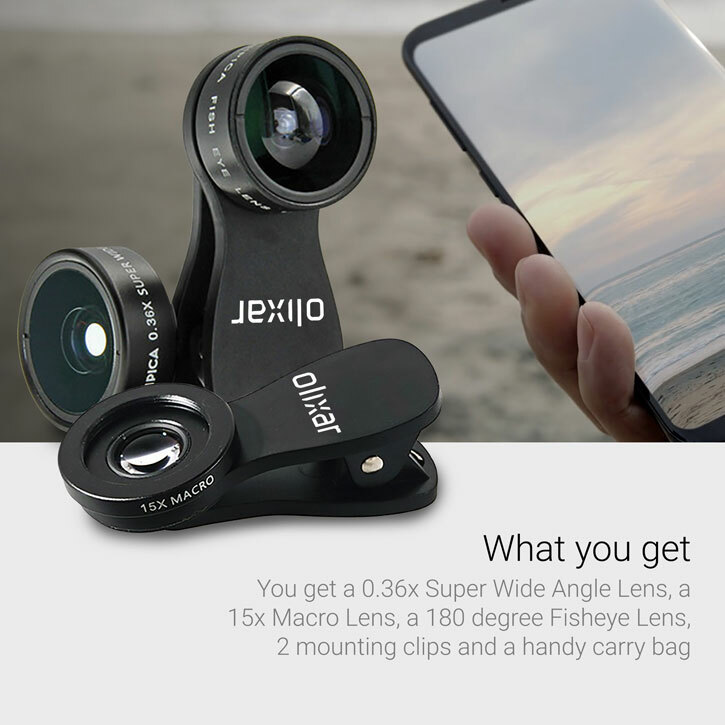 The Premium 3-in-1 Universal Clip HD Camera Lens perfectly accompanies your device's photography apps in order to create truly unique and stunning images. Ideal with instagram, Camera+, Hipstamatic and many more, so you can experiment and create exciting new photographic styles. The protective carry case ensures your 3-in-1 camera lens is with you at all times, with a built-in carabiner to attach to belts and bags. Also included is a microfiber bag, which helps to protect your camera lens kit as well as a providing a great material to clean them with too. Please Note: The Macro Lens is accessed by unscrewing itself from the Super Wide Angle Lens. This is easily accomplished.